I’m in afghan-making mode, again. A combination of upcoming events, new yarn to try, and anticipation of cooler weather (not happening yet) has put me in the mood. This is Peaceful from the Leisure Arts “Big Book of Quick Knit Afghans.” I’ve made this afghan before, and I’ve knit from this book many times. The afghans are beautiful and (as advertised) quick to knit, primarily because you use regular sweater-weight yarn knit with two strands held together. It makes for a lofty, generous result. This piece is knit with Plymouth Yarn Company’s Encore Tweed in color Oatmeal – another go-to product for afghan projects. It’s a nice and durable yarn and easy to work with. I like the tweed effect, which gives the piece more interest and depth. This afghan is a wedding gift. These days, with couples marrying later in life and not really needing the normal “house starting” gifts, an afghan seems like a nice option – everyone (in my region, anyway) can use an afghan, and it makes a lovely hand-made gift. 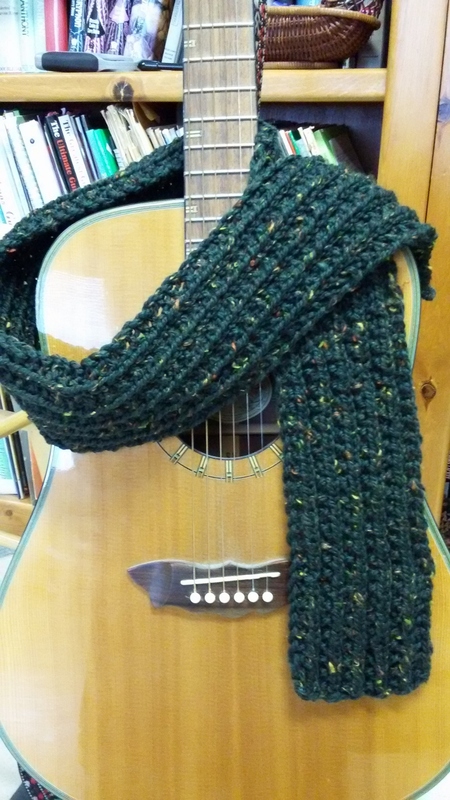 Tip – I usually include a yarn band with a gift, so the recipient knows how to clean and care for the item. Again, the Christmas confusion and the quick-knit of this project contributed to a lack of WIP photos. This is Lucienne Scarf, a paid pattern by Katinka Designs. I was attracted to it enough to pay for the pattern, and I don’t regret that investment. This is a lovely and easy to work pattern. I will certainly use it, again. My complements to the designer. Yarn is my third color of three – Shawl in a Ball, by Lion Brand, in color Feng Shui Grey. After three skeins, I still enjoy the look and feel of this yarn. While “Shawl in a Ball” is nicely poetic, I really think it should be “Scarf in a Ball,” as more accurate. All three scarves knit up to a very nice size, but would be too small for a shawl. Here is the completed project, both blocked and as finally finished. I really like the drape of the finished fabric, and the two recipients of the previous two scarves seemed to really like the end result. Note my Christmas gift to myself: Knitted Love Interlocking Blocking Mats. As you might have noticed in the previous scarf photos, I had to use two different media to block the scarves. This system lets me build the size of mat that suits the project. (That said, I would probably need another set for a larger or multi-piece project like a sweater). I have completed 3 sock patterns (technically, 4, if you count the baby-techique sock) from the Cat Bordhi’s New Pathways for Sock Knitters (apparently, no longer available from Amazon, but through some of the internet yarn stores see link above), and have thoroughly enjoyed the process. Not only have I enjoyed learning several new techniques (toe-up, riverbed construction, new heel option, and picot edging -though that last was not from Cat but from the Gardner Sock pattern), but the patterns were delightful to knit and (IMHO) turned out well. I think I’ve finally figured out the picot edging, so it’s featured on one of the photos in the slide show below. Posted on January 18, 2013 December 26, 2013 Categories KnittingTags Completed Project, SocksLeave a comment on Rushing Rivulet Socks Done!